Focus Dance Company (焦點舞團), the student company of Taipei National University of the Arts (TNUA, 國立臺北藝術大學), recently launched its 2018 Skyline-Fearless (撞牆天團) tour at its home theatre, this year under the artistic direction of Wu Su-chun (吳素君). All performances feature two works by TNUA alumni: the new Bony (嶙峋) by Lai Hung-chung (賴翃中), who now also has his own ensemble, Hung Dance (翃舞製作); and The Wall (牆) by Cheng Tsung-lung (鄭宗龍), Cloud Gate 2 (雲門2) artistic director, which was premiered by that company back in 2009. Alongside them are shorter works by student choreographers that rotate between performances. The dancing was of a remarkably high standard. It’s easy to see why TNUA and other Taiwanese graduates get work overseas. Everything is rooted absolutely in technique. As one, now retired artistic director once told me, what is important is that a dancer knows their ‘A, B, C’, their ‘dance alphabet’, because then they have a solid base from which they can do anything, and he can work with them. Too many, these days, he felt, do not know their technique in sufficient depth. As might have been expected, the highlight of the evening was Cheng’s The Wall. When danced in London by Cloud Gate 2 in 2016, it felt very dark. Here, the white floor reflected the light so much better, allowing us to see, while still keeping the work’s mood. 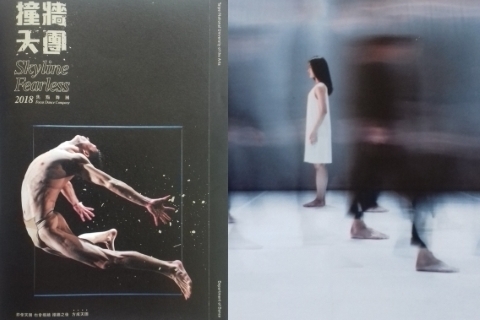 The title comes from the fact the dancers often appear isolated as if there is some invisible barrier between them. Cheng makes good use of the rhythmic patterns in Michael Gordon’s threatening but exciting Weather One. An initial walking sequence is the calm before the storm and quickly develops into a veritable explosion of dance in always interesting series of often fast-moving duets and trios with plenty of articulation of joints. 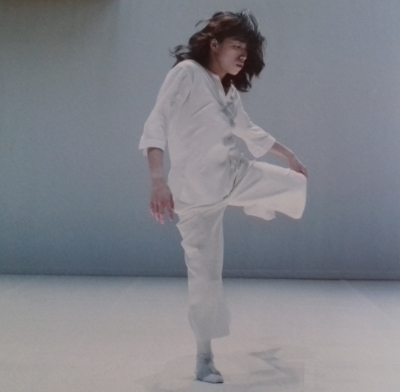 Quieter moments come from nowhere, such as a solo for a woman in white, full of sinuous movement. The young dancers coped well, although everything was not quite as sharp as it should have been at times. Lai’s Bony also has some well constructed dance in it but you had to look for it. The programme note suggested a host of ideas and thoughts including the resistance to accept the desires and feelings of who you really are, including hostile and aggressive ones; and the rock formations of the Taroko National Park, which presumably is where the note about, “time, contorted into bone-like inches” comes from. The dance is certainly intricate. Lai’s strengths seem to be in making duets and small group dances but in Bony they tend to be so buried by ensemble, usually it felt with everyone doing something different, they were difficult to see. At times, it felt like he just wanted to give everyone in his big cast as much stage time as possible (understandable) and his solution was to cram everyone on at the same time (rarely a good idea). Lai’s use of music also comes with issues. Using very different pieces of music in a single work is far from a ‘no-no’ but you do have to be careful, especially when selections are by different composers or from different eras, or have different moods or time signatures. Things tend to get particularly unfortunate when pieces are rammed up against each other as here. While on the subject, I do wish that if choreographers must use Arvo Pärt, they would realise he does have a whole catalogue to select from. You don’t have to go for one of the desperately overused pieces, here Spiegel Im Spiegel, which, as pleasant as it is, so often feels like a lazy choice. Lai at least opts for an unusual take on it with a mangled, mashed-up version. 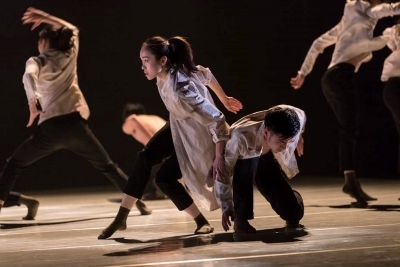 Young choreographers frequently find it difficult to manipulate large ensembles, so it was perhaps no surprise that the two student works that stood out in particular were a solo and a duet, with Lin Tse-an (林則安) having a hand in both. I like dark and moody but it is nice to have a change sometimes. Lin’s Arabesque, a bright, short but captivating solo, with him in all-white and brightly lit, came as just that. Performing it himself, the shock-haired, loose-jointed, soft-limbed Lin was reminiscent of a puppet. While the dance is happy, it’s a happiness borne out of contentment from inside and being at one with Debussy’s Arabesque No.1. It was quite lovely and just unfortunate that, here alone, the music was over-amplified. 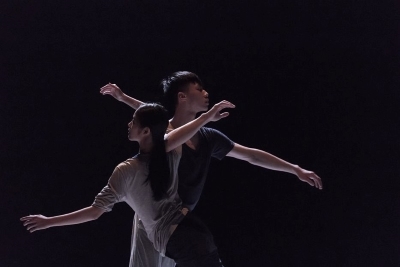 If anything, Distance (一隻手的距離), a duet choreographed by Lin and his partner, Hsu Pei-jia (徐珮嘉) is even better. It’s full of interesting and unusual partnering as the couple almost stay constantly in physical contact. And yet, there is also a sense of distance, maybe as if one is not really there, and point emphasised at the end. So smooth and deliberate was it, that it sometimes felt like a slow-motion film. The quality was maintained throughout, even when the speed picked up. The pick of the rest was Socialization (逝去的本我) by Wu Chia-ling (吳佳凌) and Lee Hang-cheng (李杭澄). The choreography, contemporary in feel but with more than a nod towards classical ballet, is clean and mostly well-structured. Although danced in soft shoes, there were several suggestions that it was originally designed for the women to be on pointe. I particularly liked the opening that features dancers walking from side to side occasionally performing a short solo en route that has a hint of Jerome Robbins’ Glass Pieces about it, and a later pas de deux to the first movement of Bach’s Piano Concerto No.1. With three other very different musical selections, the work could have been real multi-vehicle pile up but the choreographers very cleverly left enough silence between each for the changes not to grate. Elsewhere, the opening Deep Web (深層暗網) by Liao Chien-shun (廖健舜) felt confused, having a sense of narrative but making little narrative sense. At the beginning, one of the women is at the centre of things; and having a bad day. But then it’s someone else, the only woman dressed differently, who gets picked on by the rest of the cast. Then it’s back to the first one. Different people or the same? Who knows. And ditto why they all seem to end up dead. The best choreography comes in two male trios, both impressively constructed and danced. Blue Whirls (青焰) by Chang Chieh-hann (張杰瀚) is loud and all-action in every sense. Look deeply and there is lots of good material, but again it all gets lost in the crowd. Strange lighting too. What the multi-coloured splodges on the floor in particular, or the all red was meant to indicate, if anything, was lost on me. Finally, a mention for the programme editor and designer for one of the best programmes for a student company production I’ve come across in ages; and all the important parts bilingual too.